On Thanksgiving Sunday this year my girlfriend Maggie and I were preparing for a trip up into the Miramichi woodlands. For the second year in a row our plan was supper Sunday, hunt Monday – a pretty good tradition we’re starting. It made me reminisce about Thanksgiving last year. 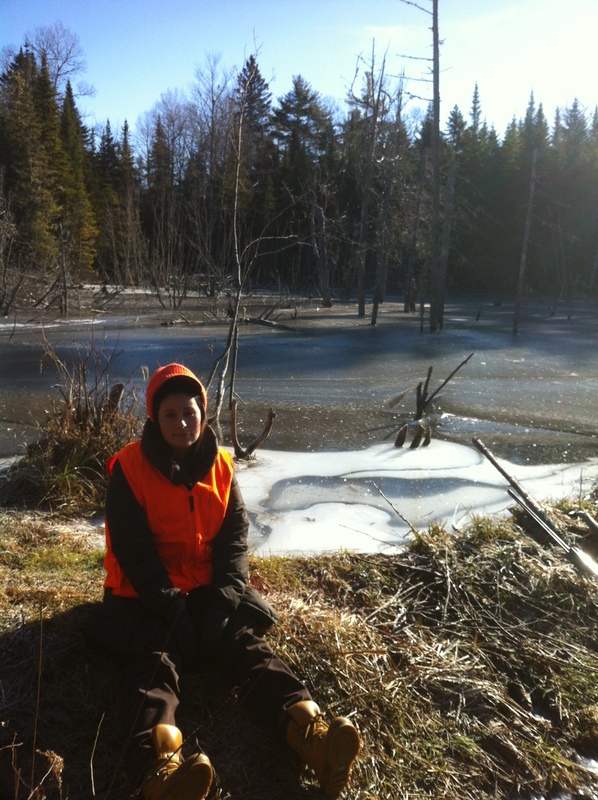 At the outset of Thanksgiving Monday 2013, I had lofty expectations for my first hunting experience in the woodlands surrounding New Brunswick’s fabled Miramichi River. Stories of the game-filled woods of the north abound throughout the province, but I learned very quickly that hunting in the Miramichi isn’t that easy. The people in this region are a persistent group; most do a variety of things to survive. Strong survival instincts have shaped some of the finest outdoorsmen that this province has ever known. The knowledge passed between generations has cultivated a woodland proficiency that is rivaled in few other places in Canada. I was reflecting on this when I noticed a grouse sneak off the trail and into some tall grass on the edge of a balsam fir stand. Maggie and I were somewhere north of the fabled Northwest Miramichi River, bumping along the Mullin Stream Rd. in my truck — deep in the woods. I stopped the truck, grabbed my 870 Wingmaster, and started quietly stalking up the road. 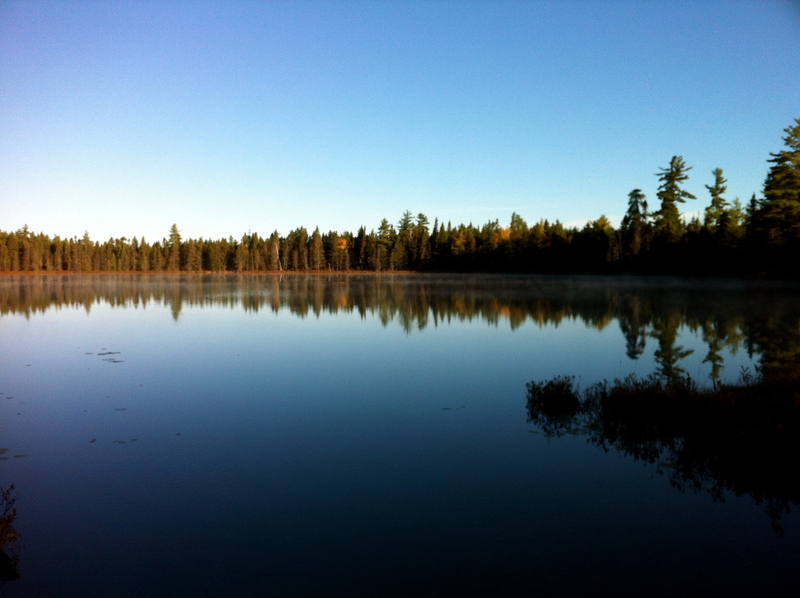 When I was within 30 yards, I stopped and listened intently — not a sound. Just as I started to inch forward the bird exploded into flight, right in my direction. I shouldered my gun, aimed ahead of the bird, and pulled the trigger. “Not even close” I muttered to myself, as I watched the bird continue its flight unabated. I watched as the bird landed in the top of a tall aspen tree 100 or so yards away, finally a break. The tree had shed all of its foliage already, providing a clear view through the canopy. The setting sun was only illuminating the treetops; the low-angled light gave the yellow and red October foliage a glowing golden tone. Again, I quietly stalked toward the bird. When I was within 20 yards I took aim. The grouse instinctively knew it was being watched, it crouched and launched itself off its perch just as I fired through the branches — another miss. I watched as the bird disappeared into the fading sunlight. We were returning empty handed. I sullenly made my way back to the truck. I told myself that I clearly just had a run-in with New Brunswick’s smartest grouse, or perhaps it was just a hallucination after a day of failure? I put my gun away, jumped in the truck cab, and looked at Maggie and said, “don’t tell your Dad about this. Flash-forward to 2014, spending a little time in the area over the course of the summer had given me a positive feeling heading into this year’s hunt. I told myself as the truck rattled up Highway 420, this year was going to be different. The sun was shining and the air was crisp on Monday morning – a beautiful day for a hunt. Unfortunately, Maggie had a little too much turkey the previous evening and was not feeling up for it, so it was going to be a solo effort. A crater lake on a beautiful fall day off of the Mullin Stream Rd. I hit the Mullin Stream Rd. around 9:30 a.m. The plan was to walk trails or bushwack through good-looking habitat. Successful habitat identification isn’t difficult. Over-grown trails lined with alders, tall grass, or immature balsam fir generally in upland stands with lots of cover in the understory are a good place to start. Things were quiet early on; the woods were a crowded place on this holiday. Dozens of like-minded groups were out participating in a traditional Thanksgiving Monday birdhunt. Fortunately for me, most of these groups didn’t appear to venture off of the road. They merely crept along in their pick-ups looking for birds on the roadside. While you don’t cover as much ground on foot, you get a better feel for the land, and for me personally, the hunt is more rewarding. This method also tests your patience, senses, and stalking ability — skills that are transferrable to other hunts. The clear blue sky and vibrant Fall foliage made up for the fact that it was a slow day. I was walking down a grassy road between two cut blocks. The edges of the cuts were lined with rows of tall large-toothed aspens. Gusts of wind caused green and gold leaves to rain down from the canopies — a photo-worthy moment. I grabbed my camera-phone out of my pocket and noticed that I had reception. I wasn’t quite ready to head home yet so I thought I’d send home an update. I tossed my gun over my shoulder, and kept walking as I texted – you can probably guess what happens next. Don’t look at your phone while grouse hunting! With my head down and mind back in civilization, I entered an immature birch-fir stand, and sure enough, a grouse exploded into flight 10 yards from me. I muttered an expletive and watched as the bird disappeared into the distance. I put my phone away and paused for a moment. Often, I get so caught up in the grouse in flight that I forget that they are frequently found in groups. As if on cue, I heard shuffling leaves in the opposite direction. I quietly slipped amongst the trees and I set myself up behind a fir tree, watching for movement. I could see an outline carefully walking through a thicket of 2-3inch birch stems. I resolved to wait and get closer. My heart was pounding. I tried to outpace the bird to get a clear shot. As I closed in the bird jumped up onto a log — it was a beautiful ruffed grouse. I was within 20-yards, so I aimed and fired. The bird disappeared off the log, which I assumed indicated a successful hit. 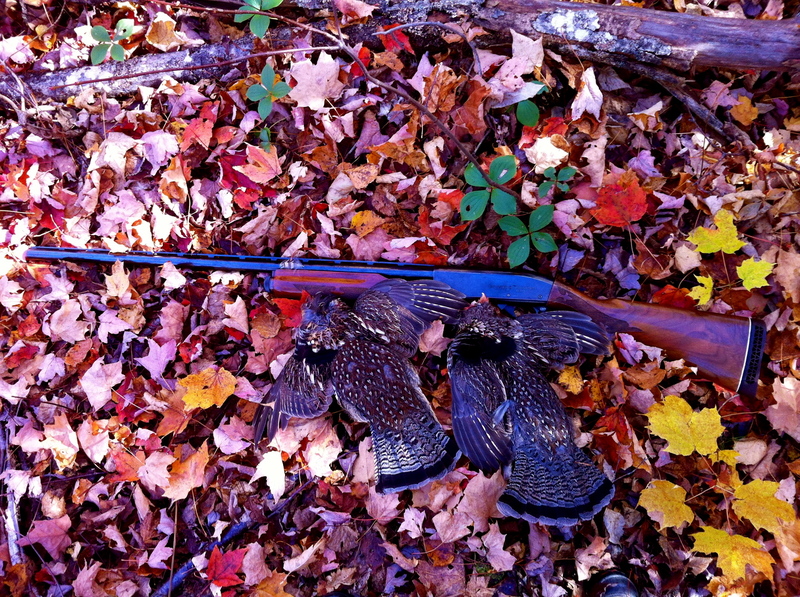 However when I approached it was nowhere to be found – man these Miramichi grouse are tough. I quick stepped in the same direction and eventually caught up with the grouse as it shuffled through some fir seedlings. When it emerged, I stepped out and fired. 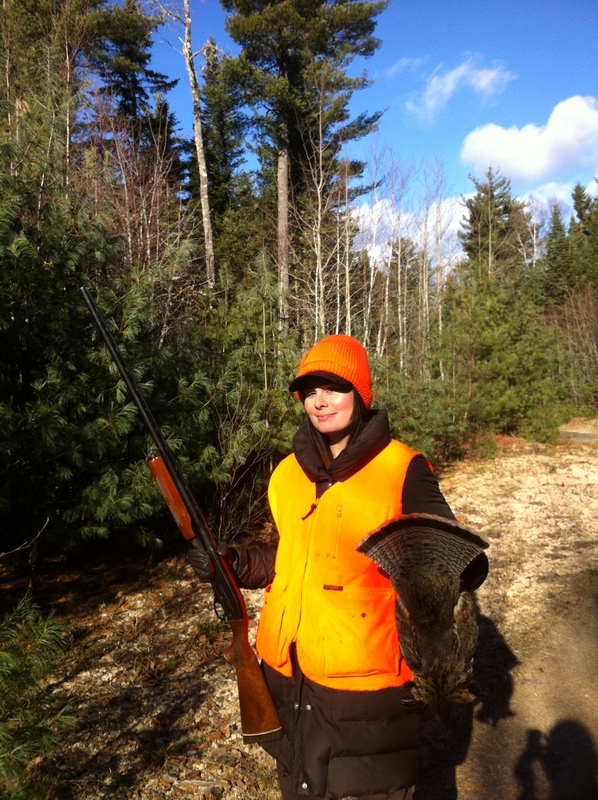 The sound of wings flapping against the forest floor indicated a hit – my first Miramichi grouse! 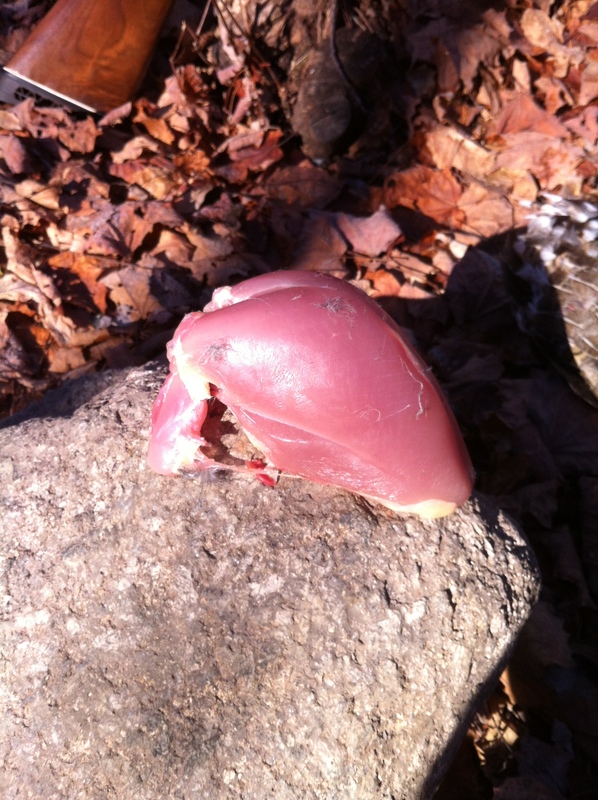 I put the bird in the game-pouch of my vest and quickly hiked back out to the trail. I didn’t want pass up the opportunity to pursue the bird that flew in the other direction. I stepped across the trail and bushwhacked through dense birch forest at a steady pace for about 200yards. As I was sliding between two stems with my head down, I heard a familiar shuffle to my right. I glanced up and another grouse was skimming across the fall-yellow forest floor. I raised my 870 Wingmaster and fired. A good clean shot gave me my second ruffed grouse of the day! I put the second grouse in the game pouch and started the trek out to the truck. Two birds was enough for me for the day, it was time to head home. Another great day in the woods of New Brunswick, a place where hunting traditions are alive and well.